Dad: OK everyone. Let’s sit down to eat Christmas dinner! Jason: Dad, can we pull the Christmas crackers now? Dad: Sure, Jason! Go ahead. Mother: Oh, look at those cute little toys. OK, Jason, now let your sister pull a Christmas cracker to see what she gets! Sami: You know what? I have another idea for our Christmas party this year. Let’s have Christmas crackers! Petra: What? I don’t know what that is. Sami: Well, in Britain and some other English-speaking countries, people “pull Christmas crackers” during parties. 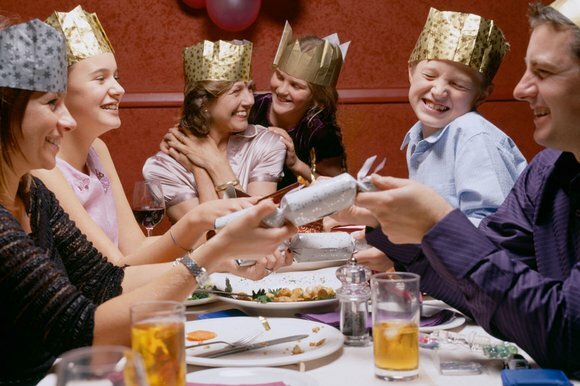 The Christmas crackers contain little trinkets, toys, or even jokes on small pieces of paper. Petra: That sounds interesting! Let’s do it. Meaning: A Christmas Cracker is a cardboard paper tube, of brightly colored paper and twisted at both ends. They are usually given during Christmas dinner or at Christmas parties. They make a noise when pulled apart by two people and contain small presents like toys, trinkets, or even jokes on pieces of paper. Christmas crackers are part of Christmas celebrations in the United Kingdom, Ireland, Australia, Canada, New Zealand, and South Africa. Christmas crackers are not very common in the United States.